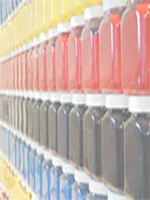 S-PRESS | Heat Press | Heat set your fabrics inks quickly and easily. Using a press is a fast way to eliminate the water based medium, activate the pigmentation and heat set the inks to the fabric. The time and temperature for heat setting will vary depending on the material used, the size of the design and the volume of the design. Prints can be heat set when wet or dry. A wet print is considered under 48 hours from printing. After 48 hours from printing, natural evaporation of the inks assists to create a dry print where a shorter heat setting time is required, as you are not having to remove as much water based medium in the setting process. Works for all types of clothing: Pleated skirts, pants, blouses, shirts, ties, cloth belts, and scarves. 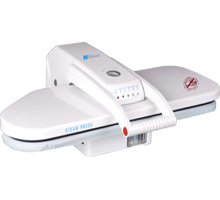 Always use caution as the heat press is hot when activated and for a period after use - never touch the heat element. When turned on and up to temperature, lower the press over the design. Most models will beep after 15-20 seconds (depending on the model) as a mandatory safety feature to avoid overheating/ burning the fabric. Lift and let air for about 5 seconds then lower again and set once more. 3 presses may be enough for 'dry' prints where the temperature setting is correct - if too low you will need 4 presses. For wet prints (less than 48hrs old) you will need to set 4-8 times. Prints that are less than 1 hour old will take approx. 2 minutes total to set. Clean with damp cloth only with equipment off and unplugged. The above details are used for product support only. No information is recorded, stored, subscribed. By submitting this form you agree NEHOC may use this information (and any reply) for publication. In such cases, only name may be used, with e-mail discarded so no persons may contact you regarding the information.